Some of the most common and most expensive calls I receive are from the homeowner who is calling after attempting to clean up spills and small stains and are either unsuccessful or worse have caused the stain to spread to a larger area. Most times, the stain is handled and the homeowner satisfied. However, there are times where the homeowner has done enough damage to the stain that the carpet must then be repiared or replaced. Here are a few do’s and don’ts for when the inevitable hits you. Grab a rag and begin scrubbing furiously in the hopes that the stain will disappear like a smudge on glass. Spills on textiles react in a very different manner than spills on hard surfaces. Even with Scotchguarded materials, the spills will spread to all sides of the textiles they come into contact with. When you scrub a spill on a textile, the spill migrates from fiber to fiber and very little of it actually transfers to the rag. You end up with a larger spill and more than likely you have also scrubbed the spill into the backing of the carpet as well. Using a flat instrument like a butter knife or putty knife lift all of the solids off the textile as posssible. Continue to collect from the outside in until all of the solids have been collected and removed. Grab a clean, white terrycloth towel and wet it with hot to the touch water. Take the towel and press on the spill from the outside in with light pressure. You are attempting to transfer the remaing spill from the textile to the towel. Continue the transfering of the spill, moving to clean sections of the terrycloth towel until no more transfer occurs. Once this is done, you should be left with very light discoloration from the original spill. Now move on to your favorite household, over-the-counter carpet or spot cleaner. Use a very light application while again pressuring the spill from the outside in with a new, clean terrycloth towel. Be patient and work the spill until it is removed. If you have a hand-held carpet cleaning unit, you can flush the spill as well. 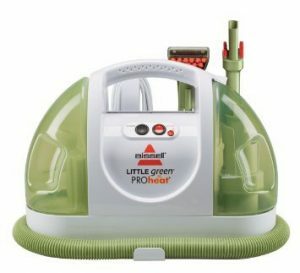 Use the over-the-counter carpet cleaning solution by pouring or aggressively spraying the spots or stains in your carpet. I have seen many of these cleaners over applied, and when done so can bleach the carpet and leave discoloration in the opposite direction. These cleaners are made to handle aggresive clean ups. If not handled with care, they can cause more damage than was originally left by the spill. Take the over-the-counter cleaner and dilute it in a secondary spray bottle. You can always work your way up when spotting. 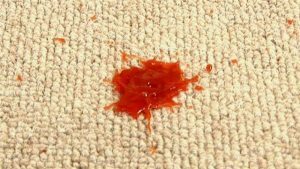 However, when you apply too much, there is nothing that can be done to protect the carpet from the effects of bleaching. As mentioned, if you have a hand-held spotter, this is much more effective a cleaning method than simple spotting alone. In addition, it flushes the cleaner left behind and leaves the carpet much softer and less apt to resoil due to a cleaning agent left in the fibers. Assume that spot cleaning is enough to maintain your carpets and area rugs. While spot cleaning is always recommended, it can’t do the job alone. Sopt cleaning can do wonders for removing the occassional stain or spill, but agents are left behind and the remainder of the carpet is still just as dirty. Bring in a professional carpet cleaning service to perform a regular cleaning every six months. Ensure that the cleaning service is utilizing truck-mounted technology when possible. Truck-mounted technology is more powerful, both in producing heat and in the collection of the moisture laid into the carpets to perform the cleaning. Fast dry times are paramount to a successful cleaning. Be sure to point out any and all issues with your carpets including pet stains, food and drink spills and any areas where you have performed your own treatments. A successful cleaning will flush a majority of these contaminants from the fibers and leave a fresh, soft textile behind. In closing, never be afraid to attend to your home as you see fit. Just do your best to ensure that you are as educated as possible in regards to the most successful application of the cleaning you desire. Toro Steam Cleaning is a locally owned and operated small business in San Diego specializing in carpet, tile & grout, upholstery, area rug and hardwood & laminate cleaning. Toro Steam Cleaning is also certified in natural stone cleaning and restoration services. Experience the Toro difference.